What is transshipment bill of lading? When does transshipment bill of lading release? 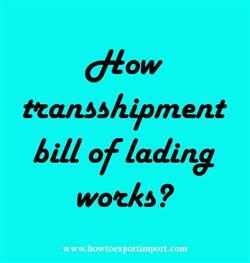 Transshipment bill of lading is another type of bill of bill of lading. Do you have more to explain about transshipment bill of lading? Write below your experience and comments on transshipment bill of lading. PEDRO FOX: On 01 April 2018 definitions of transhipment are mentioned in ICC UCP 500,UCP 600?